Where to start tiling is very important so spend some time planning the layout of the tiles before you begin. There is no definitive way to do this and it may well depend on your particular circumstances like positions of windows, walls and alcoves,etc. 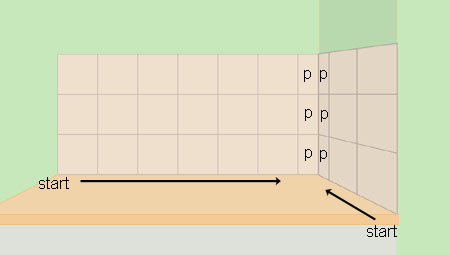 Measure the mid-point between each corner.The aim is to start tiling in the middle along your timber batten and end at each side with a part tile. 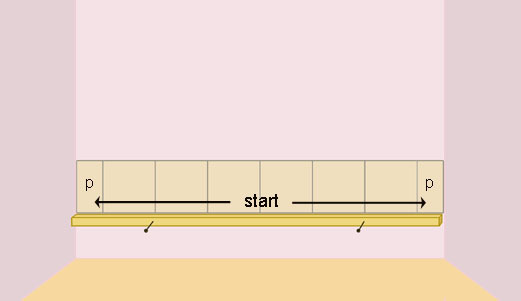 Try laying out your tiles on the batten to measure out the positioning, or you could mark the position on the batten. When you're happy you can apply the adhesive and lay the first tile. Once you've got the first row of tiles on the rest should follow nicely. 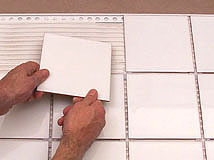 Use tile spacers to get each tile line up perfectly. A couple of examples are shown below. 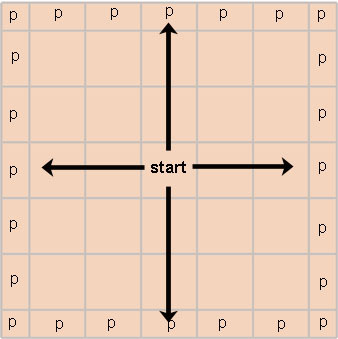 Again there are several ways to do this but remember whichever method you choose that if you are tiling elsewhere they line up with each other. Using this method you will probably have to do some tiling downwards. Use masking tape to hold tiles in place with higher ones which you've let dry first. The edges of some tiles are not made to be seen and so on outer corners they will look better with edging strip. This simply fits behind the tile and is held in place by the tile and adhesive. Again, like tiling walls, because edges may not be square DON'T start at the edges. 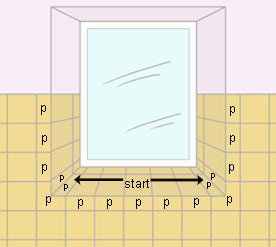 Mark a line running parallel to a wall so that your first row of tiles runs right down the middle of the room. 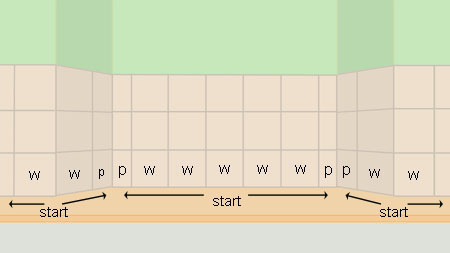 Layout some tile so that you can ensure you end with roughly equal part tiles at each end. (Depending on your room and tile size you might find you need to start with a row of tiles on either side of that centre line so as to end with a decent sized part tile at both edges. Work out from the middle ensuring all full tiles are perfectly lined up and square.